A shop teacher and many of his students come through the ER after a horrible shop incident. When Levi runs his blood alcohol test, he sees that the alcohol content is higher than he's ever seen before. Richard takes to the case and takes it personally. He wants to prove that the shop teacher has a drinking problem. 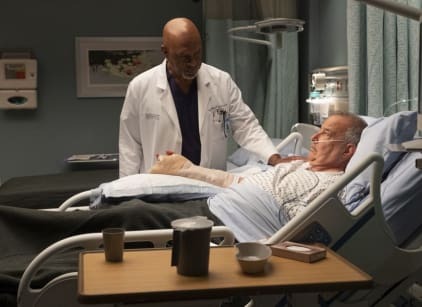 It leads to him and Link, who is tending to amputate the guy's fingers, butting heads over Richard's failure to communicate and badgering the patient. Richard offers the man a liquor bottle (filled with water) to test the man, and he learns that the man was not inebriated as suspected. Alex reprimands Richard for the incident, but Richard doesn't take Alex seriously as Chief. Alex is on his first day, but he's not doing the best and is overwhelmed. Bailey is supposed to be taking her break, but she finds herself cleaning up after Alex's messes, which upsets JO who wants to work on her research project with Bailey. Jo wants to go by Karev now. Meredith has to put Cece back on dialysis. Cece keeps prying into Meredith's life to help her in her dating life, and Meredith starts wondering if Cece is right about her not being open to love. Roy dismisses a patient in the ER because the guy has a nosebleed. The guy ends up dying and Roy freaks out not wanting to take accountability. Alex fires him. Maggie tries to pair Amelia up with DeLuca and later with Link because she's trying to keep Amelia from getting serious with Owen since she knows about the baby. Owen and her clash and he wonder what her deal is. Maggie is upset because Jackson took off without telling her even though he emailed everyone else. He needs personal time to process what happened to him. He left her a voicemail explaining that if he looked at her he wouldn't have left her.